The first week of Great Lent, also called "Clean Week," is a week without classes so that the entire seminary community can assemble for a rigorous schedule of services. The week begins on Sunday evening with Vespers and the Rite of Forgiveness, when each member of the community asks the forgiveness of every other member of the community. Each weekday begins at 6:00 AM with Midnight Office, Matins, and 1st Hour, until approximately 9:00 AM. After about a 45 minute break, everyone reassembles for 3rd, 6th, and 9th Hours, Typical Psalms, and Vespers. 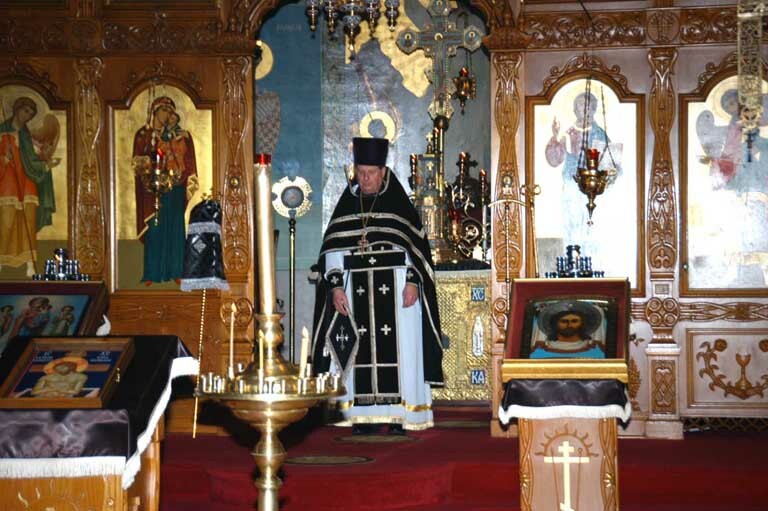 On Wednesday and Friday Vespers is replaced by the Liturgy of Presanctified Gifts. At 4:00 PM Great Compline is served with the Great Canon of St. Andrew of Crete. On Friday evening Matins for the first Saturday of Great Lent is served at 4:00 PM. On Saturday morning the Divine Liturgy of St. John Chrysostom is served, commemorating St. Theodore the Tyro. On Saturday evening and Sunday morning All-Night Vigil and the Divine Liturgy of St. Basil the Great are served for the Sunday of Orthodoxy. 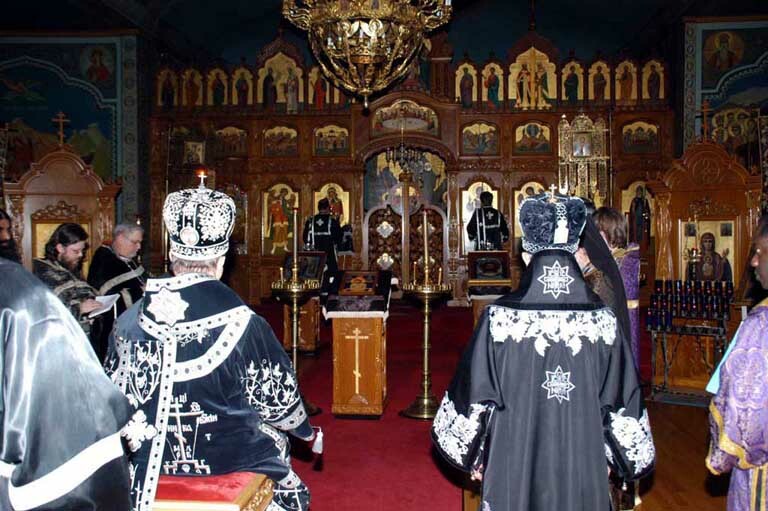 On Sunday evening the Rite of Orthodoxy service was held at 5:00 PM at Holy Resurrection Cathedral in Wilkes-Barre, PA.
Met. Herman, Met. Thodosius, and Bp. 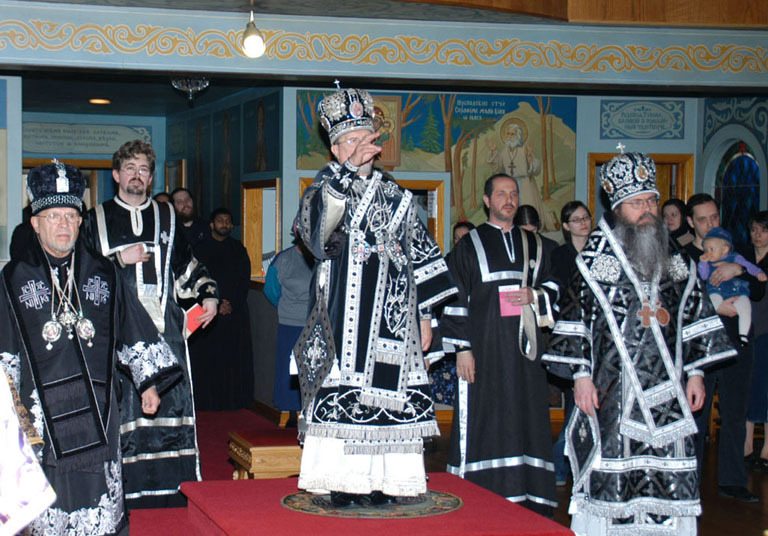 Tikhon assembled for Hierarchical Presanctified Liturgy. Fr. Michael Lepa receives the blessing of His Beatitude, Metropolitan Herman. The Presanctified Lamb is transferred during the reading of the 3 Antiphons of the 18th Kathisma. 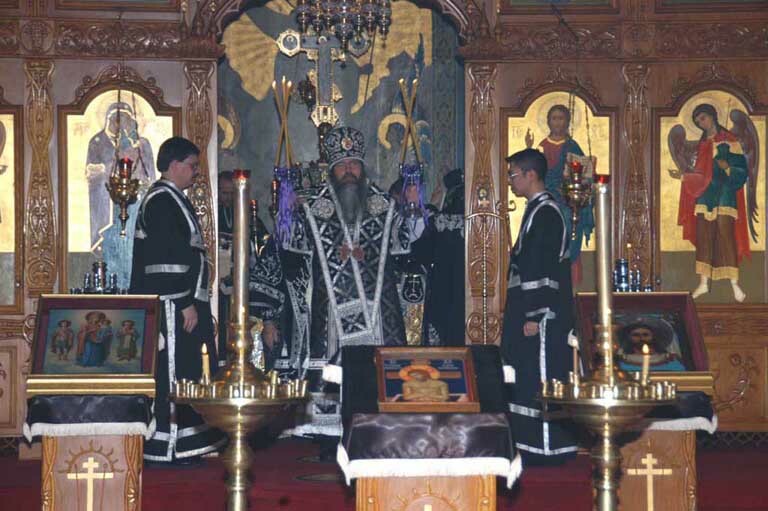 Bishop Tikhon blesses with trikerion and dikerion after the transfer of the Presanctified Gifts.